July’s Object of the Month could very easily be overlooked if you were to stand in Shaw’s study looking at his crowded desk and yet, like June’s Object of the Month, it represents another of Shaw’s great friendship networks and takes us back to his homeland. 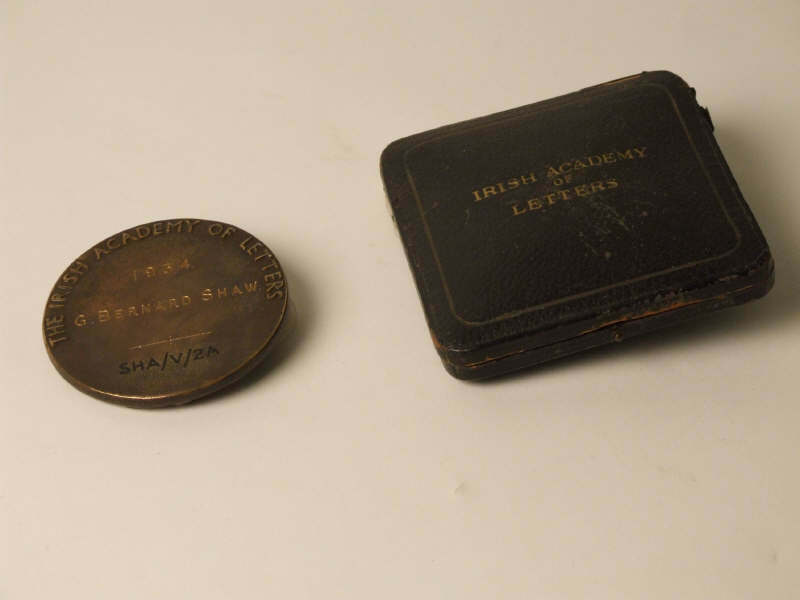 It is a medal, from 1934 commemorating Shaw’s membership of the Irish Academy of Letters. The Irish Academy of Letters was the brainchild of poet William Butler Yeats, who by the 1930s had known Shaw for over forty years; since they were both young men moving in the Bedford Park circle around William Morris. They had a complex relationship, with Yeats once describing Shaw as a “smiling typewriter” and Shaw finding Yeats’ romantic and idealistic view of Ireland difficult to cope with. Despite this (and both men being involved with the rather fabulous Florence Farr) they did establish a strong and long-lasting relationship. It was Yeats who commissioned John Bull’s Other Island for the opening of the Abbey Theatre in 1904. The poet rejected the play as too long, too difficult to produce and too controversial. As Shaw wrote in the preface to the published edition of the play: “Like most people who have asked me to write plays, Mr Yeats got rather more than he bargained for.” There are still tickets available for our performances of John Bull’s Other Island at the end of the month. Have a look at our website to find out more and book your tickets! As well as being a member of the Irish Academy of Letters, Shaw was also elected its first president in 1932, despite initially agreeing to Yeats’ proposal only on the condition that he would not have to take an active part in it. He served as president until 1935, when Yeats took over, then was re-elected for another year after Shaw’s death. 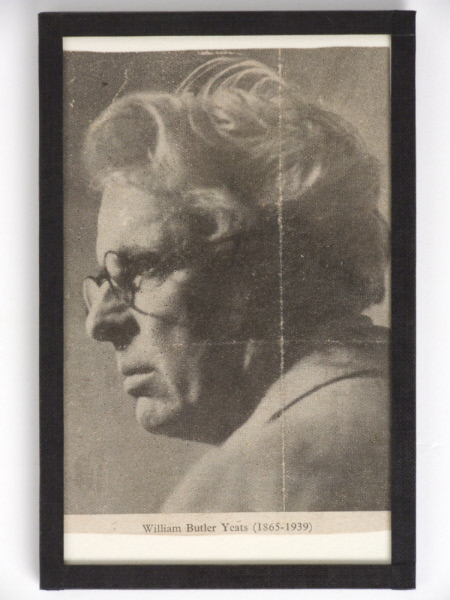 This image of W B Yeats hangs on the wall of Shaw’s study and is taken from the poet’s obituary. 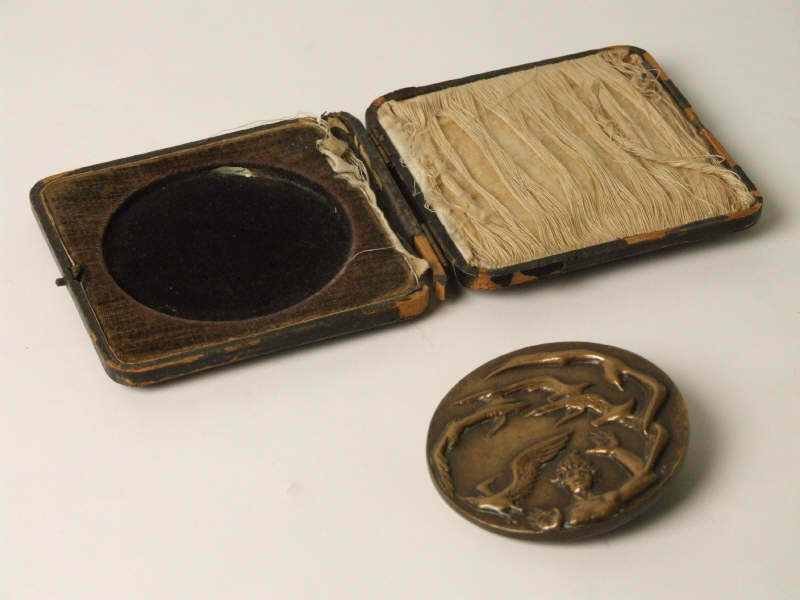 As well as Shaw and Yeats, other founder members included George “AE” Russell (see February’s Object of the Month), St John Ervine and Edith OE Sommerville (who was also Charlotte Shaw’s cousin). T E Lawrence and Eugene O’Neil were also nominated as associates. Sean O’Casey and James Joyce were also invited to join, but declined. You can find out more about Joyce at the Irish Academy of Letters here. This entry was posted in Collections, Famous friends, Object of the Month and tagged Ayot St Lawrence, George Bernard Shaw, Irish Academy of Letters, National Trust Collections, Object of the Month, Shaw's Corner, William Butler Yeats, Writer's Houses. Bookmark the permalink.